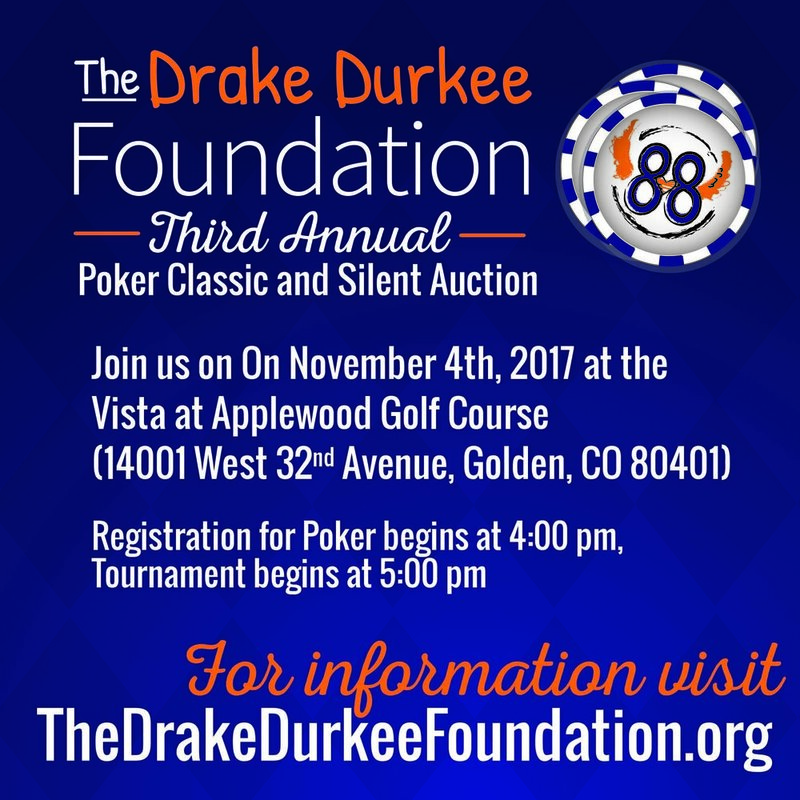 The Fourth Annual Drake Durkee Foundation Poker Classic and Silent Auction was held on November 3, 2018 at The Vista at Applewood Golf Course. We had almost 60 entrants in the poker tournament! Coming in fifth place was Drew Walters, fourth place went to David Thompson, third place was Greg Cheer, second place went to Jack Walters and our first place finisher was Russ Lazzara. The top three finishers won poker tournament bracelets along with a number of other great prizes! The silent auction portion of the night went very well! We had a variety of autographed sports items including a basketball signed by Lebron James, an autographed Mickey Mantle baseball, a Von Miller autographed jersey and many more. There were several non sports items as well. The event turned out to be a wonderful success! Efforts from that night, coupled with previous support from the community, allowed us to be able to present the Ralston House with a check for $15,000. These funds will be used to sponsor a playroom currently being built at their new location and will serve as a safe and comfortable place for children who have been victims of abuse and are in the process of being interviewed or waiting for a check-up. We can’t thank this gracious community enough for all of its support! Your generous contributions help to continue our efforts to spread kindness and support to those in need here in our community and beyond. Our event brings the community together, raises funds for important causes and shares the contagious Kindness that Drake represented! Next year’s event has already been scheduled for November 9, 2019! We hope to see you all there! Thank you to everyone who participated in our first annual golf tournament, hosted at the beautiful Applewood Golf Course in Golden, Colorado! Players arrived for a 7am scramble start, playing in teams of four. Teams got to participate in different activities at each hole, while raising funds for the foundations. Congratulations to our essay winners! Payton Kruse and Max Trujillo JOINED the foundation at the NOCOLPB Breakfast. Drake Durkee Foundation private screening of "Wonder"
We were excited to provide a free premiere of the movie Wonder, based off the award-winning book. The movie showed to a fill theatre at the Colorado Mills Theater. We would like to thank everyone who joined us for our 2017 Poker Classic and Silent Auction! We will have more information about the event soon! We would like to thank everyone who participated in our 2017 Intentional Day of Kindness! Stickers were handed out to showcase acts of kindness, and stories were shared with the website of Intentional acts of kindness. We look forward to the next Intentional Day of Kindness, where we hope even more acts are done. The Second Annual Drake Durkee Foundation Poker Classic and Silent Auction was held at The Vista at Applewood Golf Course on November 5th, 2016. The event saw an outstanding attendance from both players and not, with people of all ages having a good time. Many quality items were auctioned, including Superbowl Championship gear, autographs and fine art. The first annual Drake Durkee Memorial Poker Classic and Silent Auction was held on Friday, November 6, 2015. It was held at The Vista at Applewood Golf Course. Almost $9,000.00 was raised and has helped the foundation get up and running. We had almost 60 entrants for the poker tournament. Coming in third place was Gary Homyiak. Second place was Jason Putnik and First place was Robby Lohr.First and second place each received a championship poker bracelet as well some other great prizes which included a travel package to Mesquite, Nevada, a vodka gift basket, a Starbucks gift basket, Broncos game tickets and more. We also had some outstanding items to bid on in the Silent Auction including: A Von Miller autographed helmet, a Demarcus Ware autographed jersey, a mini dirt bike, a smart balance board, Oakley sunglasses, elegant wine and wine glass gift baskets, Denver Bronco memorabilia baskets, Broncos game tickets and much more. In addition, there were great raffle prizes which included gift cards to local restaurants and businesses. Great food and fun was had by all! This year’s event has already been booked for Saturday, November 5 (what would be Drake’s 13th birthday) at The Vista at Applewood Golf Course. Go to the upcoming events tab for more information.